Blackjack is one of the most popular casino games. It is by far, the most popular table game. Blackjack can be played with from one to eight decks of cards. In casinos it is often played with multiple decks, to make "card counting" more difficult. In the game, all numerical cards have the values of their respective numbers. Face cards all carry a value of 10. Aces are semi- wild, and can have values of 1 or 11. In blackjack all players play against the dealer, not against each other. The dealer deals each player 2 cards. Then the dealer deals himself 2 cards, 1 face up, and 1 face down. The players can show their cards, as their is no advantage in hiding them. 1 of the dealers cards, and must decide to ask for additional cards (take a hit), or stand (take no additional cards). They can keep taking hits, but if they go over 21 they go bust, and lose. The dealer also takes hits, or not. The dealer has no free will, his actions are according to fixed casino blackjack rules. For example, take hits if less than 17, but stand for 17 or more. 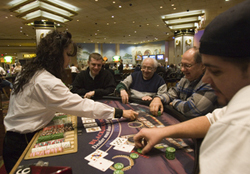 The player wins his bet if his hand totals more than the dealer's, and loses if less. They split if both are equal. If the player goes bust, he loses. If both the player and the dealer go bust, the dealer wins. This is where the house has its advantage. Players can increase their odds in winning if they have a good understanding of the game, and play according to well known basic strategies (see below). But even then, the house still has a small advantage. Player who play, but don't know of, or follow these basic strategies have a poorer chance of winning. It is off of such players that casinos make most of their profits. A technique called card counting, is often used by sharpies who closely follow the game, and who have good memory skills. With card counting players hope to keep track of the face cards played, and therefore better judge whether to take a hit, or not. 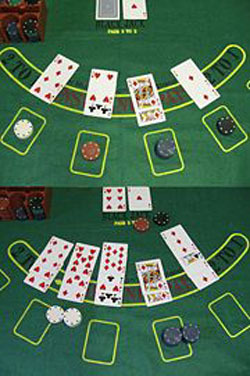 One card counting technique, called the Thorpe Technique, is described below. Group 1 is cards from 2s to 6s. Any card played in this group is worth -1. Group 2 cards are those from 7s through 9s. Any card played in this group is worth 0, so can be ignored. Group 3 cards are 10s, face cards, and aces. These are each worth +1. As the game goes on the player keeps track of the running total. If the total is running positive it means that more high cards have already been played, so the odds on taking a hit and going bust are lower. Conversely, if the running total is negative, it means more high cards are still out there. The running total become more meaningful as the number of cards played increases. It is most effective when using one deck of cards. However it still has some effectiveness when multiple decks of cards are used. Atlantic City casinos use six decks of cards, in an effort to reduce the effectiveness of card counting. Because blackjack has an element of player choice, players can reduce casino advantage to less than 1% by playing optimally. The complete set of optimal plays is known as "basic strategy", and is shown in the table below. H - Hit, take another card. S - Stand, take no more cards. Dh - Double your bet (if not allowed, then hit). Ds - Double your bet (if not allowed, then stand). SP - Split, double the wager and have each card be the first card in a new hand. This option is available only when both cards have the same value. SU - Surrender, forfiet half the bet and give up the hand. Surrender is not offered in all casinos. If the dealer's upcard is an Ace, the player is offered the option of taking "Insurance" before the dealer checks his hole card. The idea of insurance is to protect you in the case that the dealers hole card is a ten or a face card, which would give the dealer blackjack. Insurance is a bad bet because it has a house advantage of 2 to 15 %. Never take insurance.